Puttering in the kitchen with kids is always messy and fun, especially when it results in some funky looking candy. A few months ago, Lila went to a one-day science camp. Her favorite activity of the day was the making of a candy called lava toffee. When I went to pick her up in the late afternoon, she was waiting not-so-patiently to taste the confection. Unfortunately something had gone wrong with the recipe (they likely did not heat it to a high enough temp)- the candy failed to set and the campers did not get a taste. Little miss was crushed and only settled down when I promised her we would make it at home "one day". That day came during Spring Break week in mid-March. You know the quick and dirty volcano you can make with just vinegar and baking soda? This candy works on a similar principle, only using heat instead of acid to release carbon dioxide from the baking soda. You cook a sugar syrup to the hard crack stage; this is the temperature (300F) which gives a hard, crunchy texture upon cooling. Then add baking soda to the sugar syrup. The heat decomposes the baking soda (sodium bicarbonate) to sodium carbonate, water and carbon dioxide. The bubbles of carbon dioxide make the sugar syrup foam with a dramatic lava effect and the candy cools into a beautiful honeycomb candy. Lila is too young to understand or care about the science of lava toffee; all she wanted to do was eat it, but older kids might appreciate it as a tasty science experiment for a school science fair! I used this recipe- it needs only a few pantry ingredients and a candy thermometer. 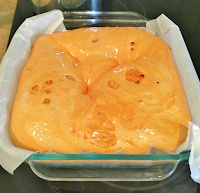 The recipe worked like a charm, foaming dramatically and then cooling quickly into this light, spongy, crunchy candy. A cup of sugar makes a very generous 8 inch x 8 inch pan of candy. The only thing to watch out for is that the candy burns quickly: take the syrup off the heat the instant it gets to 300F. Our candy ended up having a bit of a burnt after-taste because I let it linger at 300F for a few seconds. Next time I will skip the honey, which probably also contributed to the burnt taste. A couple of years ago, we enjoyed a weekly local vegetable box delivery (community-supported agriculture or CSA), as seen in these posts. Then we were busy with other things and I did not renew the subscription. I just got around to signing up again for a CSA for 16 weeks. 1. Strawberries- Washed and eaten in 5 minutes flat. 2. Carrots- Tender spring carrots are best enjoyed as a snack and that's what we did. 3. Radishes- Radishes, radish greens and carrot greens all went into a radish sambar. 4. Beets- Beet thoran as an accompaniment to khichdi. 5. 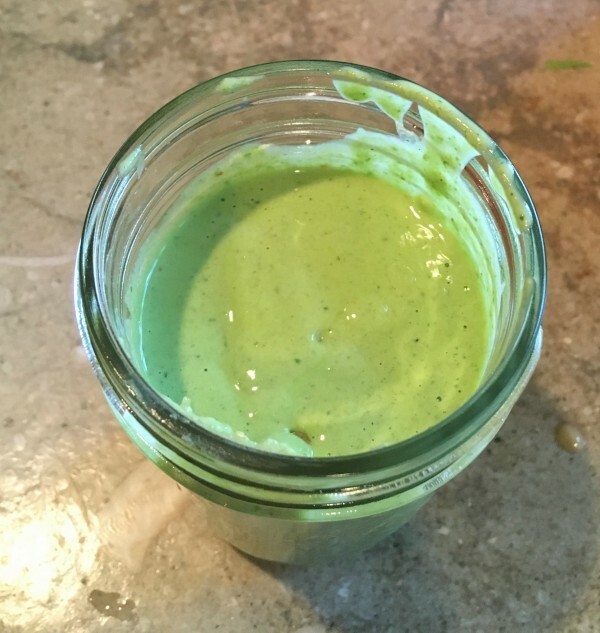 Parsley- Made into a simple and wonderful dressing in the high-powered blender with tahini, lemon juice, salt, pepper and some water. 6. Arugula- Potato arugula frittata; took this to a friend's house as our contribution to the meal. 7. Scallions- Tofu stir fry. 8. Baby greens- A few different salads. You can't eat any more locally than this! 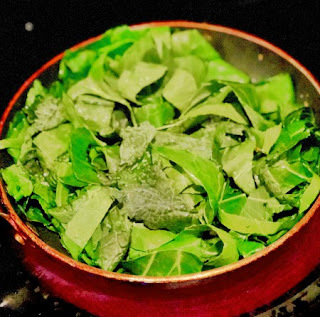 These collard greens came from the vegetable garden in Lila's school- proudly planted and tended and lovingly harvested by the kindergarteners. Lila came home with a bag of shredded kale and recited a recipe- to cook it with sea salt, vinegar and honey. Fitness Update: I wrote a couple of months ago about signing up for a weightlifting class called BodyPump. So far, so good. I have been going religiously 3 days a week for the last 12 weeks. The biggest difference I see with regular exercise is that it brightens my mood. I do feel stronger but there are no magical before-after pictures like you see in the ads- building muscle is not something that happens overnight and it is going to take a lot longer than a few months. I am excited to keep doing this. When I schedule exercise formally by writing it in my calendar, I can stick to it. Once in my calendar, the fitness class is on par with other things that I don't blow off on a whim- like conference calls and parent teacher conferences. The plan to start running again has not materialized because I have vague desires to run but never put in on my calendar, but I hope to add in some running or swimming into the exercise rotation in the coming weeks. How has March/April been for you? Tell me everything! Veryy good blog post. I definitely love this site. Continue the good work! The candy sounds like a fun experiment to do with kids!! Please share the recipe for beet thoran. Would love to try it out. I’m making some lifestyle changes like eating healthier and exercising more often. Let’s see how that goes. So far, one month down and I’m doing ok.
My 2 year old is driving me up the wall. Literally. Demanding kid. Refuses to nap, wants to jump around all day, wants mommy’s attention. Sigh! This too shall pass. Two year olds are exhausting creatures, aren't they? My 21 month old is pretty much what you're describing so I feel you :)Hang in there. Sorry to hear about your health scare and hope this never happens again! I hope to resume swimming or aqua aerobics after decades in a nearby pool. great to hear about your regular classes. good luck! Thanks for the note, dear Hamsini! I do plan to do CSA updates every week, fingers crossed. How fun that you found a fresh and affordable source for veggies! And that your kiddo started going to a school you're excited about. All good things :) and good luck to you for getting back in the water! Interesting. Bless Lila - Reminds me of mysore pak - should try adding a bit of soda to it and see if the makes the same result. AA_Mom- Mysore Pak never occurred to me but yes, it does resemble mysore pak in how it looks! Mysore pak is glorious compared to this candy though, which tastes of nothing but sugar- but does have a very interesting texture. Oh Nupur, everytime I read your posts I wish you lived on my street! 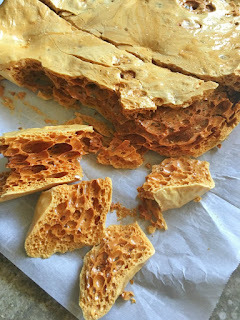 I love the honeycomb - have made it only once but it is exciting - probably would be much appreciated by my daughter now (she was quite little last time I made it). 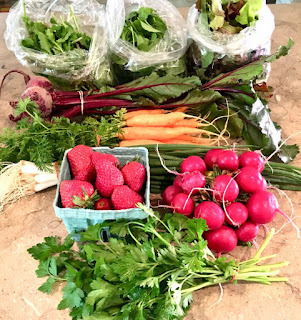 The CSA box and the body pump sound like a life to be happy with (I spoke to someone this week raving about body pump). Hi Johanna- It is very much a life to be happy with, for these and other reasons! I do like so many things about BodyPump. Even with relatively light weights, I have a long way to go to gaining strength so every workout is really hard for me- but I still look forward to it and show up cheerful and ready to do it, so I give BodyPump credit for that. The hour long class goes by quickly and the instructors have been very supportive. But I don't know if I like the "high rep" approach where you do dozens of squats (and other moves) rapidly. I don't know if this is a good thing long-term because you risk over-use injury and lose good form. But weightlifting is the way to go for me, either continuing BodyPump or moving on to something else in a few months. I eagerly look forward to reading your posts. I’m taking steps to be more physically active & your post only makes my resolve stronger. Thank you Nupur ! I couldn’t agree more with the comment.. hoping we were neighbors ! Munni- Good for you for being more physically active, it is hard but very rewarding! The candy looks delish! My little ones love puttering in the kitchen as well! Your menu for the CSA sounds wonderful. I am so impressed that yu have managed to get in 3 times/week in your schedule. I am barely able to get in two. Hopefully when the weather gets better here in Chicago, I will be able to squeeze one more in. Good luck! Sangeetha- What do your kids like to do in the kitchen? I do hope you get lots of nice weather in Chicago soon; this feels like the longest winter ever! My three year old loves to do anything. She can peel eggs really well and also helps with pancakes etc. They love to knead pizza dough or roll out parathas. And sometimes I have them chop tomatoes etc. Keeps them busy! I have tasted honeycomb a few times but never tried making them. The locally sourced food looks great and your exercise routine even better. How you manage to squeeze it all in is something of a marvel to me. My own routine has slipped off the calendar ever since my return from India though I manage a long run at the weekends and a spot of tennis during the week. My German has picked up speed and the course work is very demanding. Sometimes I wonder if I am rushing it. Just like how you cannot rush the growth of a tree (C'mon, get on with it! Sprout some leaves and grow your trunk!) and how it takes its time, I have come to notice that being at ease with a language also takes its time and B2 level of Deutsch is truly challenging. Besides, I am self-publishing a book called 'Life On An Eversilver Plate'. It's a food memoir (naturally!) and I would be grateful if you can have a read (it's just 15,000 words long) and share your feedback. Thank you! Tennis and running is all good! Fitting in the exercise classes has definitely not been easy- it takes a lot of planning of other parts of my life to make time for this- but I've managed and hope to continue. Learning a new language as an adult is no joke- you are awesome for working so hard at it. I would LOVE to read your book. How do I find it? Please e-mail me! Nupur, thank you kindly. I have just received the options for cover designs and it is rather exciting. Once it is out, I will send you an email with details. Much obliged.